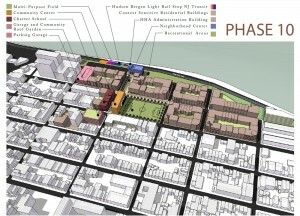 Site of existing buildings on the Hoboken Housing Authority campus. Hoboken’s rebirth from a former industrial working-class city to a more affluent, modern, bustling, comeback city has made it a poster child for 21st-century urban revitalization. But the city’s success has not come without consequences; popular demand has diminished the availability of affordable housing, as many older apartments have been converted to market-rate rentals and expensive luxury condominiums. As a result, Hoboken’s low-income residents have had to rely increasingly on the availability of housing in the public housing projects. Like other older, urban public housing agencies, the HHA has a housing stock that is obsolete, below current safety and environmental standards and costly to maintain. The Hoboken Housing Authority (HHA) is the largest provider of low-income housing in the city. Like other older, urban public housing agencies in New Jersey, the HHA has a housing stock that is obsolete, below current safety and environmental standards and costly to maintain. The main campus of the HHA, constructed in 1949, contains 806 family-oriented public housing units in 25 separate buildings on a 17-acre site in the southwestern portion of the city. The buildings are poorly configured, isolated at the back of town and challenged by issues typical of World War II-era public housing projects: concentration of poverty, wasteful energy consumption, inability to serve handicapped residents, lack of opportunity for upward migration and poorly planned placement of buildings, creating hidden outdoor spaces giving rise to crime-related safety issues. 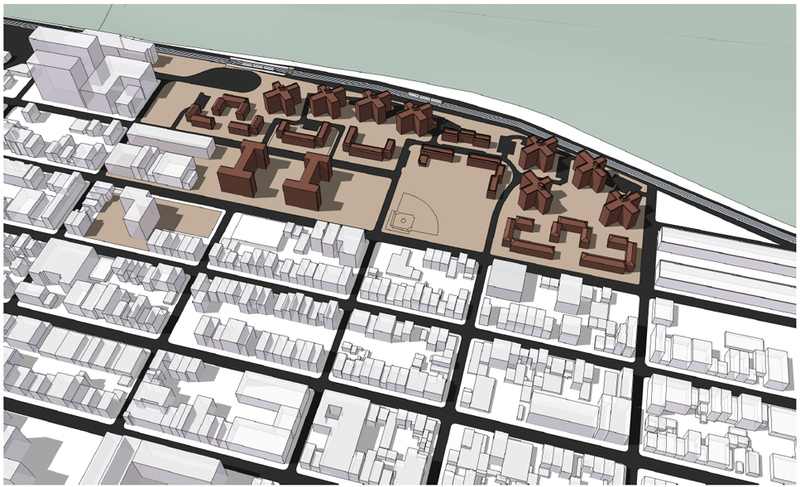 Site plan showing new vision for low-income housing and neighborhood redevelopment envisioned by the Hoboken Housing Authority. When evaluating whether to renovate or to rebuild its housing stock, the HHA determined that rebuilding was the only option. Over time, the cost to upgrade, repair and maintain the existing buildings would exceed the cost of providing new modern, sustainable, affordable housing in a mixed-income neighborhood. Two recent developments gave the housing authority an extraordinary opportunity to proceed with a rebuilding plan. Completion of NJ Transit’s Hudson Bergen Light Rail, with stops at Second Street and Ninth Street directly adjacent to the HHA campus, greatly improved access to the neighborhood. This, together with relatively high property values associated with the recent influx of new market-rate luxury housing directly adjacent along Jackson Street, created a unique set of conditions ripe for total transformation. The number of new units would exceed the number of decommissioned units, ensuring that residents will not be displaced, while providing for a variety of mixed-income housing options, allowing for upward mobility within the neighborhood and a deconcentration of poverty. The combination of its own equity in the property along with the capacity for more dense redevelopment on site, gave the housing authority confidence that it could attract public and private investment for the transformation of the HHA campus into a sustainable, transit-oriented, mixed-use, mixed-income neighborhood. The Vision 20/20 Plan adopted by the HHA calls for phased development, with residents relocated into new buildings in order to vacate the older buildings one at a time. Each empty building would then be razed to create a development site for a new residential building that would mirror the style of the surrounding residential neighborhood. At the completion of each phase, the number of new units would exceed the number of decommissioned units, ensuring that existing residents will not be displaced and, at the same time, providing for a variety of mixed-income housing options, allowing for upward mobility within the neighborhood and a deconcentration of poverty. The neighborhood redevelopment plan also allows for the extension of the city street grid through the site and includes facilities for recreation, transit, early childhood education and charter schools, retail space, shops and restaurants, and community program space for job skills training. The ultimate vision is the creation of a vibrant, healthy, mixed-income neighborhood with residential buildings that front the street; with sidewalks and trees that create an attractive, pedestrian-friendly corridor; and with retail, civic, recreational and educational uses that provide residents with a sense of hope and renewed opportunities for socio-economic growth.